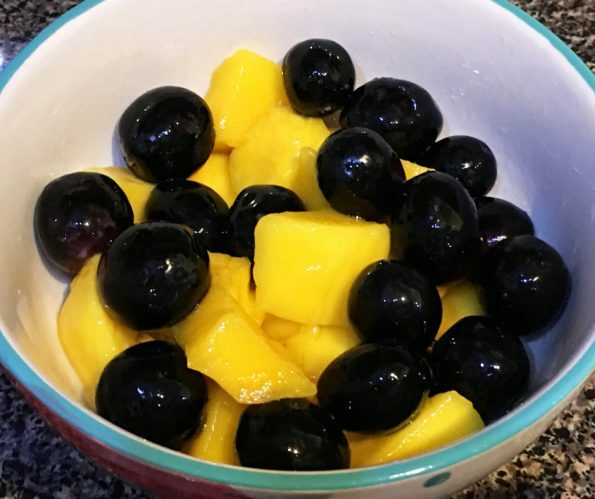 This easy mango fruit salad recipe with grapes or mango grape salad recipe is another simple, easy and yummy fruit salad like the mango banana fruit salad which is very delicious and can be enjoyed for breakfast or dessert as you wish. 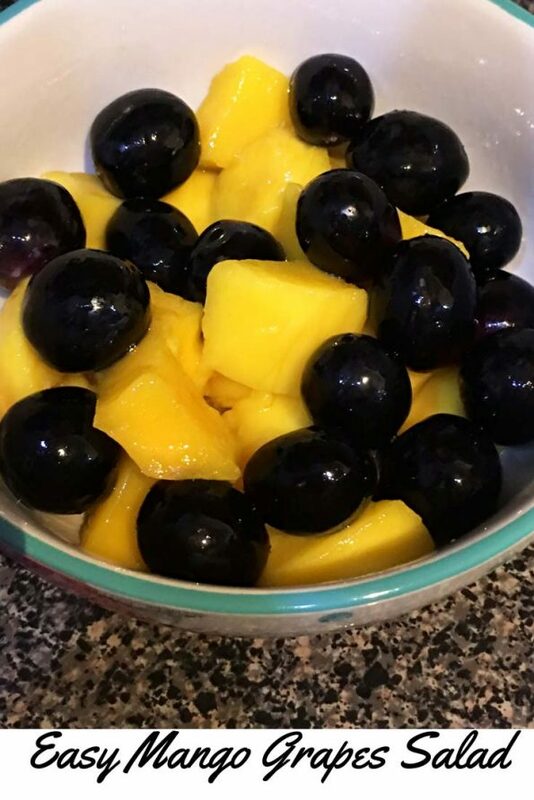 As we use two fruits mangoes and grapes for this simple fruit dessert, this is also an easy grape salad recipe or black grape salad recipe as we are using black grapes with fresh mangoes to make this fruit salad (You can try other varieties of grapes as well). This is a very easy and simple to make mango fruit salad and uses fresh fruits to make the salad. One thing I want to recommend is to make sure to use sweet mangoes & sweet grapes (a little sourness is actually good) for the salad, instead of using using very sour fruits for the best results. Something so simple like selecting the right fruits can go a long way in making yummy fruit salads. Try to choose fruits that are sweet and ripe which is slightly sour as well, but not mushy and perfect in texture. We use a little sugar to sweeten the salad even more, but if you don’t want to use the sugar, you may use pure fresh honey or skip the sweetener altogether and just enjoy the fresh mix of fruits which is more healthy. We also add a touch of fresh lime juice in this simple fruit salad which goes well with this easy mango fruit salad recipe with bananas. As I mentioned above, the perfect mangoes and grapes for this salad are sweet and little sour, which will blend the flavors so nicely. However even if you have only sour fruits, the use of sugar will help to reduce the sourness. You can store the grapes, mangoes and other fruits and vegetables fresher for longer using this berry, fruit and veggie keeper set. You can use a regular knife to peel and slice the mangoes but using mango slicer to remove the pit/seed of the mangoes and peel and slice them evenly will make the job more easy. You may also use a potato peeler to easily peel the skin of mangoes. 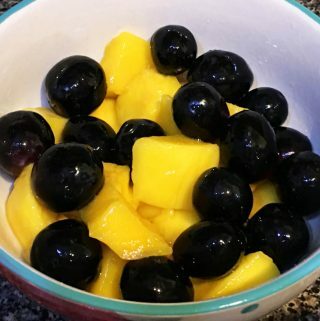 I used sweet black grapes for this easy mango salad recipe with grapes, but you can try other varieties of grapes as well like red grapes or green grapes. 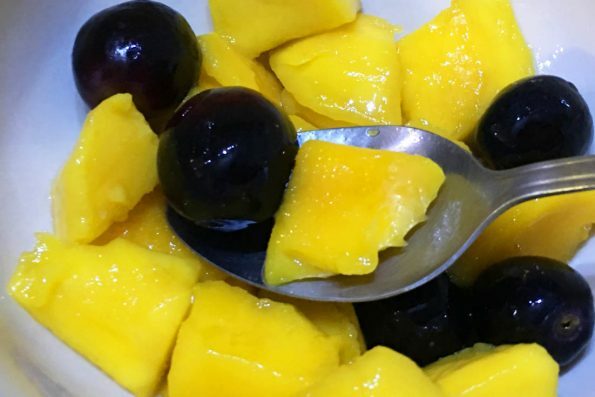 The sweet and sour combination of mangoes and grapes make the perfect fruit salad which can be enjoyed for dessert as well as breakfast or salad. You can use salad keepers or salad storage containers to make this salad in bulk and refrigerate which can be used later. You may also use a mango slicer to cut the mangoes easily. So here is how you can easily prepare this mango fruit salad with grapes following this easy mango fruit salad recipe with grapes. Easy mango fruit salad with grapes and a little lime juice and sugar is so easy to simple, but taste so refreshing and delicious perfect for hot summer months or any time of the year when fresh mangoes are available. Wash the mangoes, peel and slice them to remove the seeds and then cut into medium sized cubes. In a salad bowl, mix together mangoes and sugar. Let it sit for about 5 minutes covered. This will give time for the sugar to dissolve and blend in nicely with the juicy mangoes, which will act like a fruit salad dressing or juicy syrup. Wash the grapes too and mix in the grapes with the mangoes in the bowl. Sprinkle the lemon juice, and gently mix the fruits, enjoy the fresh, delicious, simple and easy fruit salad made of mangoes and grapes! If you are not using the fruit salad right away, I recommend refrigerating the salad and using chilled for best results! Hope you found this post on easy mango fruit salad with grapes helpful!